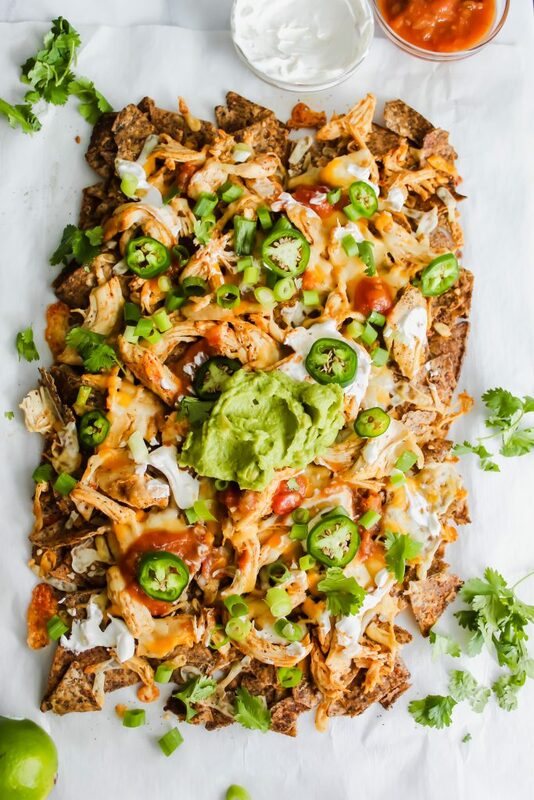 These Loaded Baked Chicken Nachos are loaded with tons of cheese, fresh veggies and all baked to perfection! They’re messy, delicious and the perfect appetizer! You guys know those meals where even if you have a bunch of napkins, it’s still never enough to keep your hands clean? And eventually you just give in to the messy gloriousness of it all and just go all in? 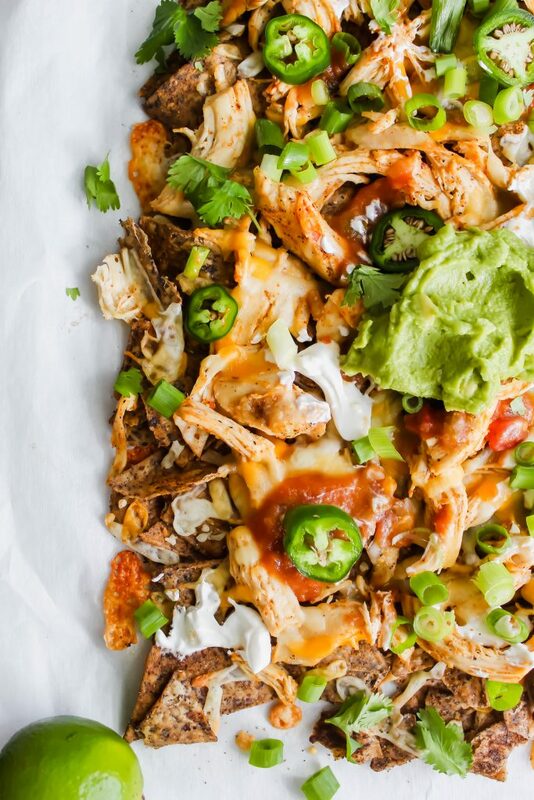 Yeah, that’s exactly what these Loaded Baked Chicken Nachos are all about. 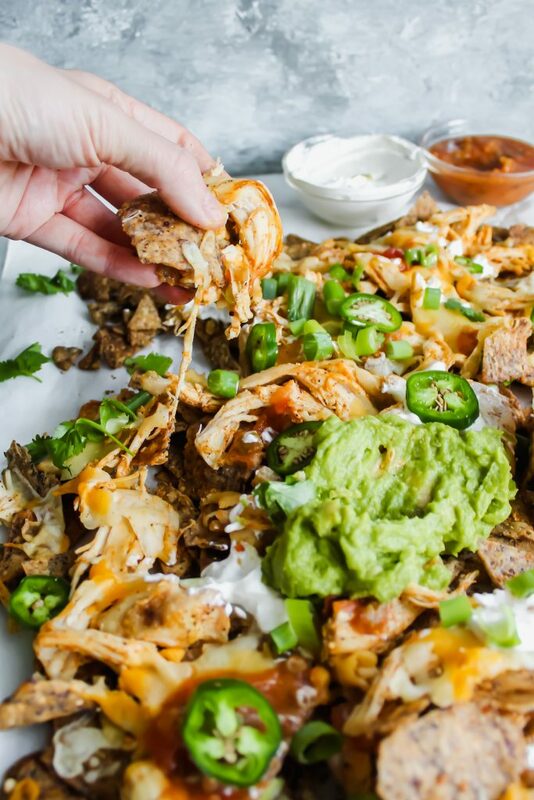 This is a recipe for when you just wanna eat nachos straight from the pan as you are watching your favorite TV show on the weekend. Or, if you’re one of thoseeee people, make this as an appetizer on game day and watch as they quickly get gobbled up. 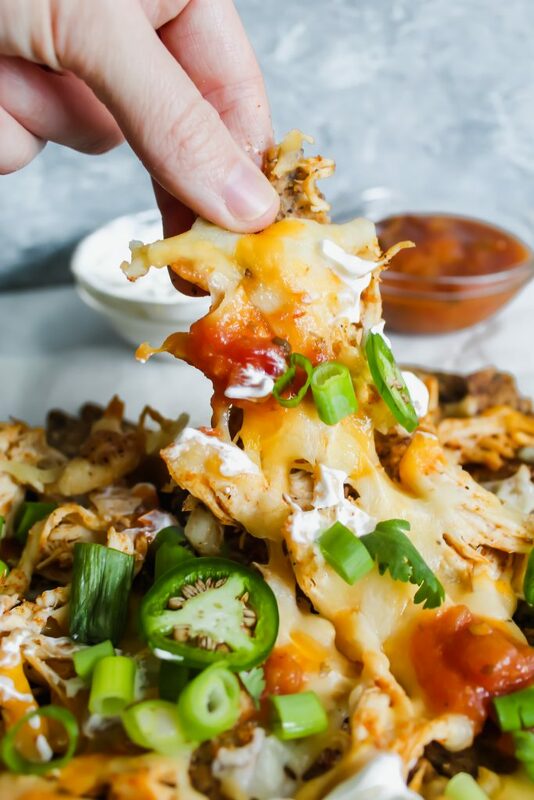 I have a deep love for chicken nachos, dating back to when I was probably about 10 years old. My favorite local Mexican restaurant in my hometown had chicken nachos as an appetizer option but for some reason, my friends and I would ALWAYS order a plate of them for ourselves as our entree. Imagine several 13 year old girls with huge plates of chips, queso cheese and maybe a few onions and green chiles on it. We were in heaven. 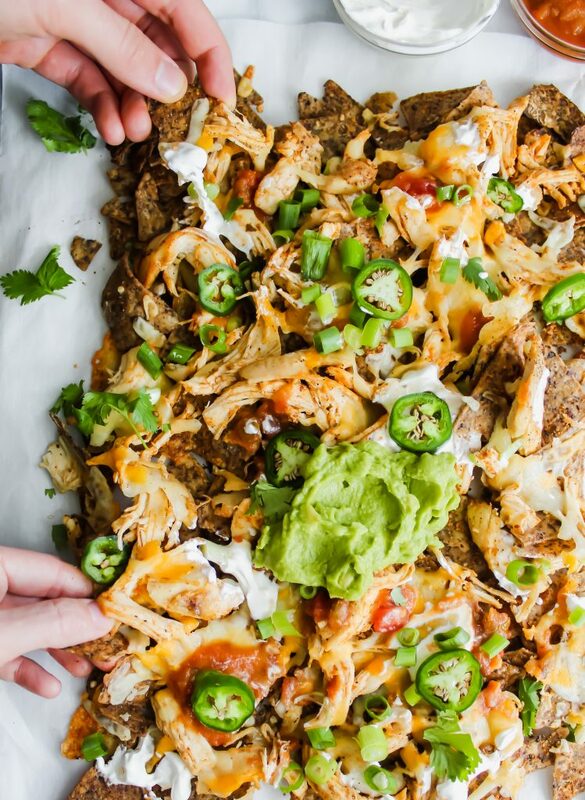 These Loaded Baked Chicken Nachos are similar – just easier! 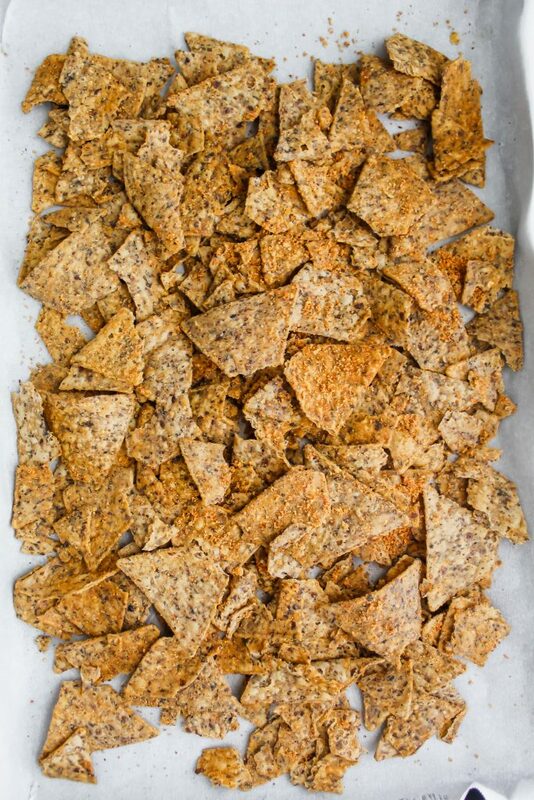 Oh, and for this recipe, I’m using Beanfields Bean Chips! If you’re not on the bean chip train yet, you should be! Not only are they filled with extra protein and easier to digest, they actually have some health benefits unlike most normal tortilla chips. Tons of fiber! Non-GMO! Can pronounce all of the ingredients! It’s a win win. But forreal, the bean chips have such a delicious, real tasting flavoring on them – especially the nacho flavor! It gives it an extra cheesy vibe. Not to mention, you get the taste of beans without actually having the beans on the nachos that ALWAYS FALL OFF ANYWAY. 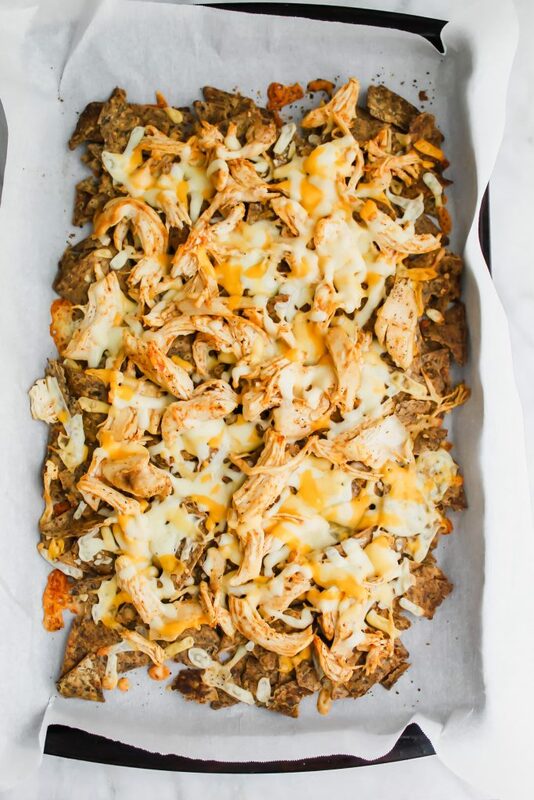 Add your baked, shredded chicken. Bake until bubbly and golden. Once baked, add on all of your toppings! The world is your oyster when it comes to toppings. You could do my easy homemade salsa! I also added a big scoop of guac, green onions, jalapeños, cilantro and of course, i smothered it in sour cream. If it’s going to be slightly spicy, you know I’m going to need some tangy delicious creamy dairy to pair along with it. 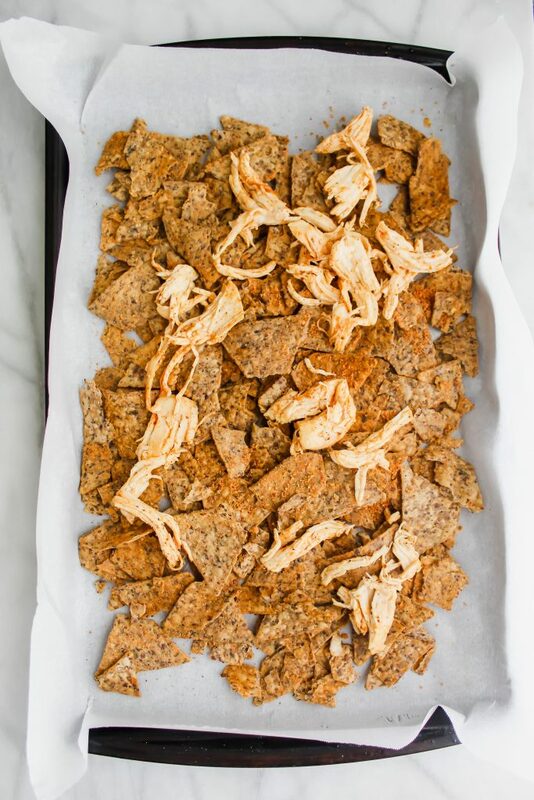 The bean chips get deliciously crispy and extra crunchy once they are baked. The chicken remains juicy and it has a kick to it thanks to my favorite Tapatio hot sauce. The cheese is melty and delicious. The toppings are fresh and vibrant. I swear you’re going to want to eat the whole pan by yourself. 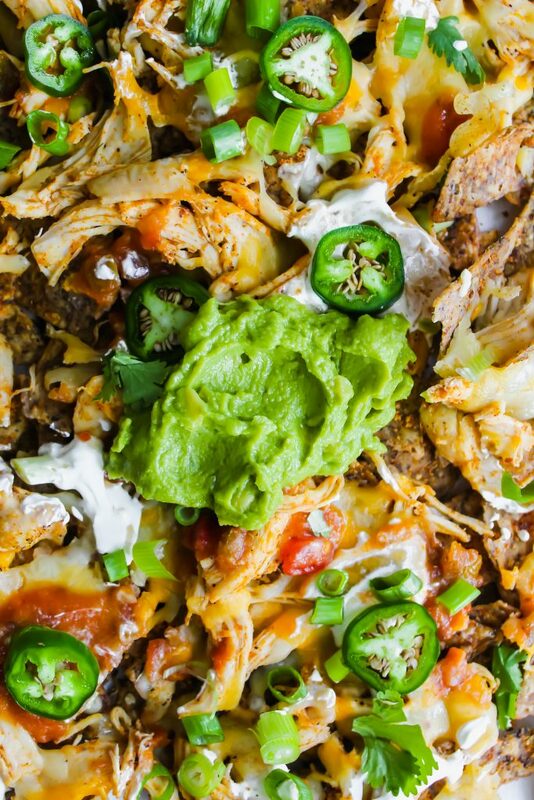 Because I mean, let’s be honest, you can’t have leftover nachos. They’re just not the same. 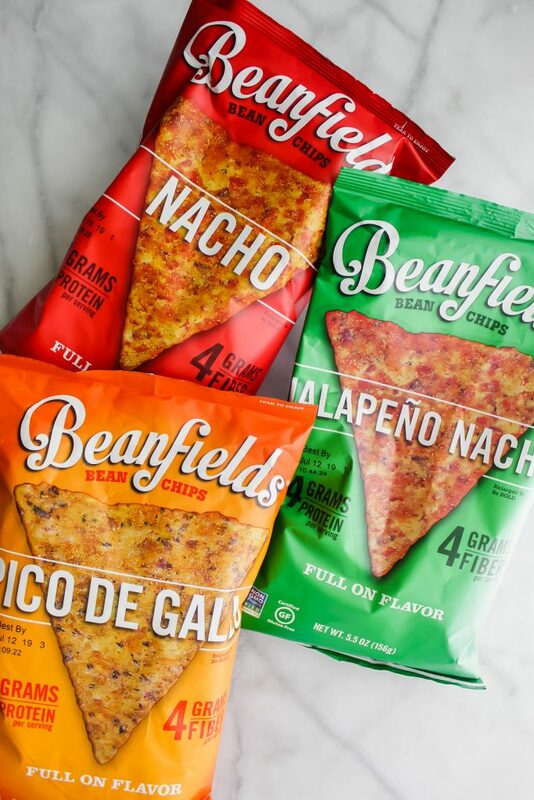 Disclaimer: This post is not sponsored by Beanfields but they did gift me these chips. All of my opinions are my own! Thanks for continuing to support me and the brands that I believe in! Preheat your oven to 350. Place your chicken breast in a baking dish with a drizzle of olive oil, taco seasoning and salt and pepper. Bake for 30 minutes or until cooked through. While waiting, prepare your desired toppings. I did jalapeno, green onion, cilantro, sour cream, salsa, and guacamole. Once the chicken is fully cooked, take it out of the oven, shred with two forks. Add the Tapatio hot sauce if desired for spicier chicken. Add parchment paper to a large baking sheet. Spread out your chips in a thin even layer. Add a layer of chicken and then cheese. Continue until it's all gone. 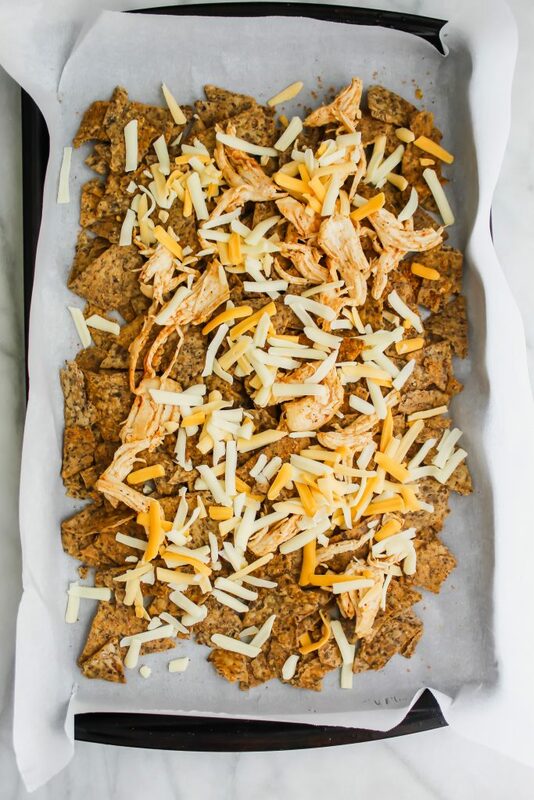 Bake for 10 minutes or until the cheese is melty and delicious. Once baked, pile on your toppings! Eat immediately while warm and the cheese is gooey! Enjoy! Note: You can use rotisserie chicken in this recipe to make it even easier! Me too, Chris! They’re so delicious and crunchy. 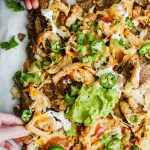 Nachos is a go-to snack in our house! My husband doesn’t eat chicken, but that’s just fine because I would devour this entire pan myself! And I’ll definitely have to see if we can get those chips here. They sound great! Yay! We love nachos in my house too. Thanks for the comment, Leanne! Fun! Make sure you make plenty with how those men eat! LOL! We loved this dish! We had some mushrooms leftover from a previous recipe and added slices of those after the first layer of cheese. I added a dash of ghost pepper hot sauce to the chicken, and along with our hot pico de gallo, it was the perfect amount of spice! Hi y’all! I’m Haylie. Southern gal at heart. 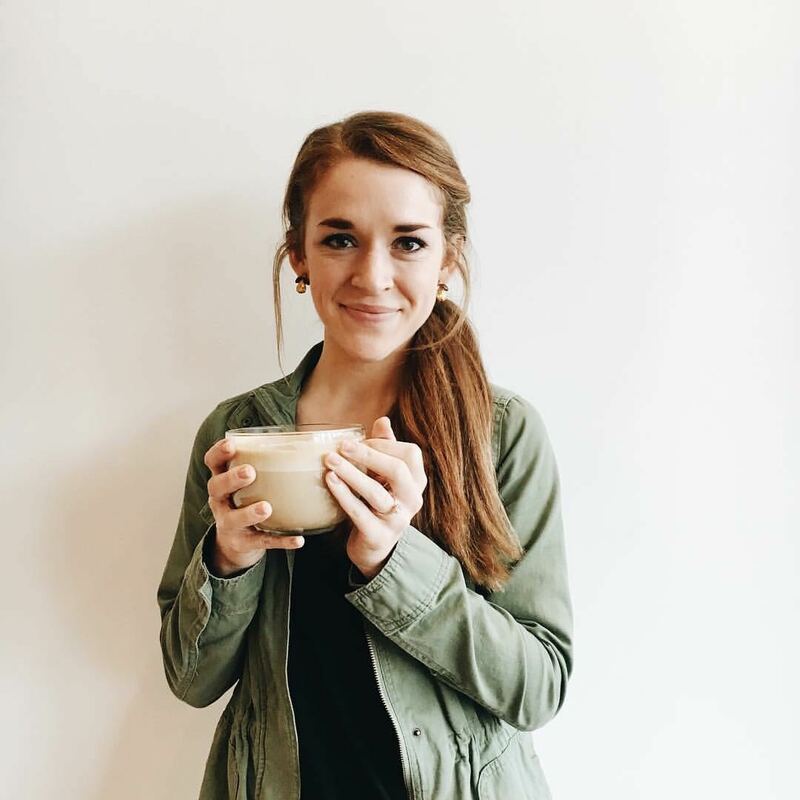 Learning the fine balance between vegetables and junk food. My husband Ben and I are newlyweds who live in North Carolina. Food is my love language. To learn more, click the photo below.